An interfaith coalition has been holding daily prayer vigils since July 11th to protect federal programs that serve people living in poverty. This coalition has formed the “Faithful Budget” campaign. Click here for worship, action, and news clip resources from the campaign. Faith leaders met with President Obama to ask him to protect “the least of these” (Mt 25) in the budget and deficit debates leading up to the debt ceiling deal. The coalition brought religious leaders to Capitol Hill on July 26 to meet with the offices of Congressional leadership. 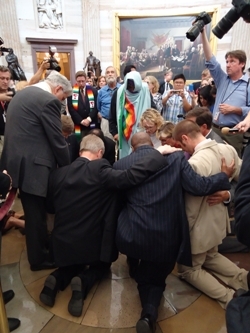 On July 28, it became clear we had to bring our prayers to the heart of the Capitol. Eleven faith leaders prayed there until they were forcefully removed and arrested.